This is the current cover of a national newspaper, Weekendavisen, which is published weekly. It's a fine, high-brow publication with in-depth articles and features. 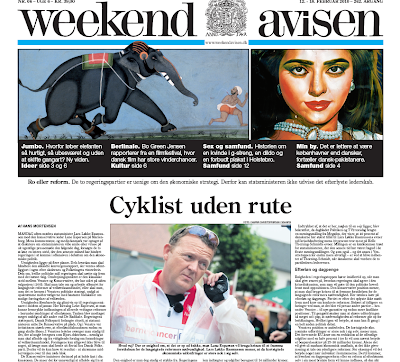 The cover features a photo of the Prime Minister Lars Løkke Rasmussen and the title "Cyclist Without a Route". The PM is under criticism of late for his lack of leadership ability. The vultures are circling. Personally, I'm looking forward to a regime change, but that's not the point of this post. It's merely to point out how a bicycle-related metaphor is used as a headline in an article about a politician. That's how deeply rooted the bicycle is in Danish culture and everyday life. It's a metaphor we all understand. Sure, the PM likes riding bicycles and rides speedy varieties in charity events. The former PM, Anders Fogh Rasmussen went for mountain bike rides with George Bush a few times, too. At a recent press conference the PM tried to answer the whirlwind of criticism by comparing politics to cyclesport. Sometimes it's uphill, sometimes it's downhill. Regardless of his metaphor, the title of the article can stand on its own. Another example of how the bicycle has penetrated our language and culture. No other country has so many songs, poems, literature references and films about bicycles. "A cyclist without a route" is not an expression in the Danish language, but there are many linguistic examples where the bicycle features. I've blogged about some before, but here's a list. Cykler rundt i det / Cycles around in it - meaning he is confused and lacks direction. "Sorry, but I'm cycling around in it today..."
Kæden hoppede af / the chain fell off - A way to describe how your day - or anything else - is not going as planned. "His chain hopped off today..."
Giv baghjul / Give someone the back wheel - What you do when you overtake someone or beat someone. At a football match a couple of weeks ago, where my son played, we beat another team and one of the parents said, "We gave them the back wheel!" Have a great second half to the weekend.